Preheat the oven to 450 degrees. Line a baking sheet with tin foil then coat it with cooking spray. Combine the butter, olive oil, and garlic together then spread evenly over the top of the fish. Season with sea salt and freshly cracked pepper, to taste. Sprinkle freshly chopped dill all over followed by a layer of lemon slices. Place skin side down on the prepared baking sheet. Place into the oven and bake for 10 minutes or until the salmon flakes easily with a fork. 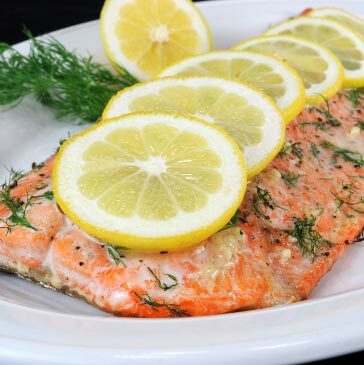 Remove from the oven and serve with additional slices of lemon if desired. Serve immediately. Enjoy.